Arashi Cover Pop travels with minimal forward movement as you pop maximizing the time your lure spends in the strike zone. Most effective when you want to draw strikes from fish that are holding tight to cover. Precision casting design, aerodynamic shape and extra tail-weight keeps the Cover Pop stable for increased distance and accuracy. 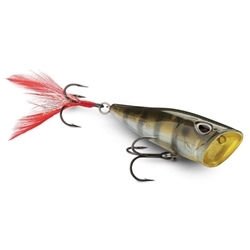 It allows the lure to enter the water tail first with minimal splash and sound. Rotated hook hangers nests that hooks close to the body for improved action, preventing hangups, even with the larger hooks, includes teaser tail feather hook.